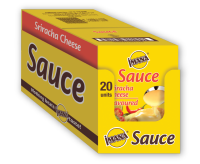 IMANA Sauces deliver richness and flavour, without compromising that personal touch. IMANA Sauces are very versatile, quick and easy to use, giving you the freedom to create more varied and delicious meals in minutes. Just add boiling water and stir and it's ready to serve. Works well with pasta dishes, vegetables, potato bakes, chicken and fish dishes to name but a few.